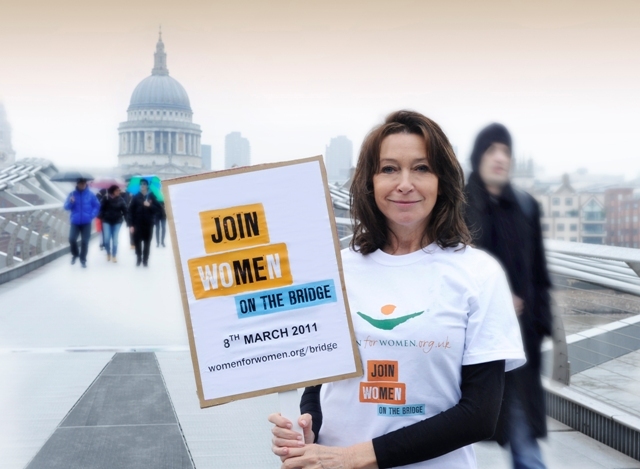 Women for Women organised a march from the Millenium bridge to Royal Festival Hall led by Annie Lennox. Fari Bradley spoke to some of the groups and individuals taking part. Groups featured are: The Soroptimists, London Feminist Network, Refugee Council, Afghan Aid and Object. This podcast also includes the speeches which took place at the end of the march, with Annie Lennox, Bianca Jagger, Lynne Featherstone (someone is shouting “get off the fence!” during this! ), the highest positioned woman on the Afghanistan Refugee Council in Afghanistan, Helen Pankhurst from Care International (descendant of Emmeline), Berra Kabarungi, Natasha Walter, Judith Wanga, Liz Morgan-Lewis (The Soroptimist president), Sophy Ridge (Sky blogger), Cherie Lunghi. This entry was posted in highlights, Promos, Uncategorized and tagged Afghan Aid, Afghanistan Refugee Council in Afghanistan, Annie Lennox, Berra Kabarungi, Bianca Jagger, Care International, Cherie Lunghi, Fari Bradley, Helen Pankhurst, international women's day, join me at the bridge, Judith Wanga, Liz Morgan-Lewis, london, London Feminist Network, Lynne Featherstone, Natasha Walter, Object, Refugee Council, Resonancefm, Sky, Sophy Ridge, The Soroptimists, women for women on March 11, 2011 by sixpillarstopersia.